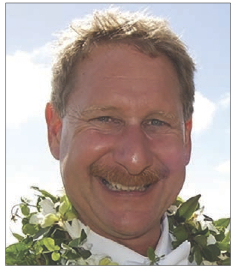 Dan Urwiler was recently promoted to General Manager at Puakea Golf Course, where he was previously the Superintendent for 17 years and Assistant Super. for the four years prior. Dan grew up in rural Nebraska and had grandparents with a farm just a few miles away. Dan's father had a membership at a Country Club in Nebraska and 'wanted to get his monies worth' said Dan, so he used to have him play golf in the morning with him to learn the game. Dan would then either work at his father's Body Shop or his grandparents farm in the afternoons when he was younger. He always had an interest in the Biology, Chemistry and Math related to growing turf and how machines worked. Dan received his degree in Turf Management at Rutgers while working at Kauai Lagoons prior to Puakea. These days, when Dan isn't working, he enjoys fishing and spending time with his family and grand kids who also live on Kauai.